I recently joined PAS. My parents gave the junior membership as a gift to me for doing well in a college astronomy class. It was so cool to see the colliding galaxies, Sombrero galaxy (spiral), M31 (spiral) galaxy, a few NGC galaxies, elliptical galaxies, and Saturn with its rings. A few weeks back, I had gone to the community observatory with my family as part of the astronomy college class that I was enrolled in this Spring Semester. The name of the course was “Introduction to Astronomy”. It was fun learning more about the universe and I liked being in the class. My professor was cool and my adult classmates were also good. I enjoyed the topics of Special Relativity, General Relativity, Fundamental Particles, Time Travel, Black holes, GRBs, and Astrobiology!! I enjoyed doing oral presentations in journal club about Kepler-10b which is an exoplanet and for my monograph about Astrobiology. I learned about possible life on Mars, Europa (Jupiter’s moon) and Enceladus & Titan (Saturn’s moons) and about extremophiles. They are cool living things! I am studying more about different extremophiles and would like to do some experiments and research with them. I am also waiting to own my telescope to view more objects in the universe like exoplanets and discover new ones. It will be awesome to work with scientists at NASA so I can learn more about astronomy. When I grow up I am going to be a multi-field scientist because I like many science subjects like chemistry, biology, physics, geology, paleontology and of course astronomy! 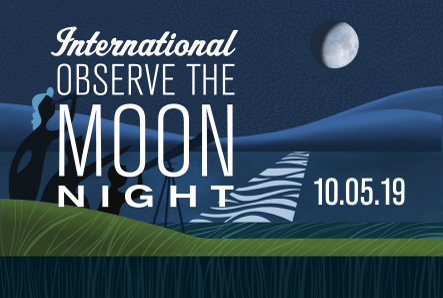 On October 8th, 2011, my family and I went to take part in the International Observe the Moon Night at NASA’s Moffet Field. It was my first time going there. I learned that Moffet Field was an airfield during World War II. I was so impressed by the size of the huge Hangar 1 that was used to keep the World War II Blimps. There were events organized by the NASA Lunar Science Institute in the day time and night time. During the daytime, we listened to talks about lunar science by scientists from NASA. It was about the different missions to the moon like GRAIL, LRO, LCROSS & LADEE. GRAIL stands for Gravity Recovery And Interior Laboratory. They are 2 satellites/spacecrafts that go one behind the other around the moon to study the moon’s gravity. The twin spacecrafts were launched on September 10, 2011 from Cape Canaveral, FL and will be in space for 3-4 months. The purpose of this mission is to map the Moon’s gravity field very accurately so that future Moon vehicles can safely navigate anywhere on the Moon’s surface. It will also help to study about the lunar crust & core structures, Moon’s thermal history, it’s history of asteroid collisions which can help lunar scientists about the evolution of our solar system. Both GRAIL-A and GRAIL-B have cameras for MoonKAM which is a program where students can take photos of the Moon using the cameras. I am looking forward to use this program. On June 18, 2009, an United Launch Alliance Atlas V rocket launched carrying 2 spacecrafts. They are the Lunar Reconnaissance Orbiter(LRO) and Lunar Crater Observation and Sensing Satellite(LCROSS). LRO has 7 instruments. These instruments are used to measure lunar radiations and its impact on humans, map the entire lunar surface to understand the lunar terrain for future safe landings, search for water and ice on the lunar surface, subsurface and in the poles. The other spacecraft is LCROSS. (Lunar Crater Observation and Sensing Satellite). When it was launched with LRO, LCROSS separated and went around the Earth and Moon in the Earth-Moon orbit. Later, part of the LCROSS called the Centaur rocket separated and it crashed into the Moon. The other part called the Shepherding spacecraft of the LCROSS observed the impact and later crashed into the Moon. LRO observed this impact. Because of these powerful impacts, it threw tons of debris and maybe even water ice and water vapor into the lunar surface and thin atmosphere. The last mission I heard about is called LADEE. It stands for Lunar Atmosphere and Dust Environment Explorer. It will launch in 2013 at Wallops Flight Facility in Wallops island, VA. This will be the first time a NASA spacecraft will launch from this site. It will also be the first time a Minotaur V (a type of rocket with 5 stages on it) will fly in space. At the night time, we got to see the Moon and other planets through powerful telescopes that many astronomers from PAS and in the Bay Area brought. It was nice meeting Mr. William Phelps from PAS who had a nice big telescope. My younger sister and I had to climb on mini-ladders to see through the telescopes. I was excited to see through the big telescopes. We even got a live tour of the Moon by Mr. Brain Day! I could see lunar craters like Tycho & Copernicus and other small craters & Maria ( a lunar lava flow that happens when a huge asteroid or meteorite impacts the Moon). When the sky became cloudy, the Moon was covered with clouds, and then it became ‘Observe the planets’! We saw planets Uranus & Jupiter and the 3 Galileo moons! It was a fun day (and night)! I didn’t want to leave NASA Ames! It was almost 9 pm and my parents’ patience was running out as we had a long drive back home…..of course I and my sister slept in the car ride. 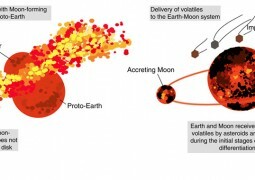 Wet asteroids delivered the majority of lunar water, while comets contributed only a small proportion of volatiles to the interior of the Moon.